NOTE: PLEASE NOTE THAT THIS IS A SUGGESTED ITINERARY. THE TRANSFERS, ACTIVITIES AND EXCURSIONS ARE IN SHARED SERVICES, MAY VARY ACCORDING TO THE TIME OF ARRIVAL AND DEPARTURE AND ARE SUBJECT TO CHANGE ACCORDING TO THE PREFERENCE OF THE CLIENT. DAY 1: ARRIVAL AND ACTIVITIES. 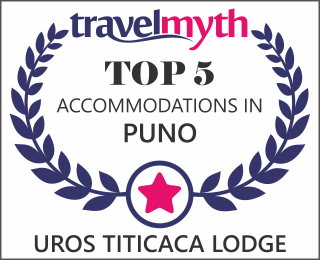 Reception and transfer in a private transport from Puno hotel to a pier and take a boat to Uros Titicaca Lodge which is located within the world's highest navigable lake. (Approximate travel time 30 minutes). When arriving to Uros Titicaca Lodge, registration, rest and enjoy the view of the place that offers spectacular landscapes and service of lodging after lunch it is recommended a siesta and much liquid to acclimatize to the altitude, in the afternoon enjoy the activities around Uros Titicaca Lodge (go to fit the fishing nets), the free hot drinks are served 24 hours a day followed by dinner and talk with other guests, interpret and local family. DAY 2: TOUR TO THE FLOATING ISLANDS OF THE UROS. The view of the place offers spectacular landscapes, after breakfast at a suitable time, you will visit the floating islands of the Uros one culture in the world "THE TOWN OF THE LAKE "set of floating islands made by its inhabitants, we are a community that lives thousands of years in the midst of the reeds called Totora, we are dedicated to fishing, hunting and as well as to the sale of handicrafts. The men are skillful builders and drivers of reed boats in the Lake Titicaca and women are skilled weavers. After the tour we returned to Uros Titicaca Lodge and had lunch in the afternoon you can enjoy the activities around the lodging or fit the fishing nets and cutting Totora, demonstration on reed boat, followed by dinner and talk with other guests, interpreter and local family. DAY 3: FAREWELL AND TOUR TO THE ISLAND OF TAQUILE. The next day we will proceed to collect our fishing net that we put the previous day and see the diversity of native fish of Lake Titicaca; after breakfast an unforgettable experience, you will take the boat to the island of Taquile, where we will have a hike, we appreciate the work of terraces, custom and tradition of its inhabitants, its way of life through its textiles, and taste a delicious lunch on the island. After enjoying the landscape of majestic Lake Titicaca return to Puno and transfer to the hotel in Puno / Farewell. 18:00 pm Reception at train station. 18:30 pm Transfer and boarding toward the floating islands of the Uros. 19:00 pm Arrival to Uros Titicaca Lodge, registration, accommodation. 19:30 pm Dinner and overnight. DAY 2: VISIT THE FLOATING ISLANDS OF THE UROS. 10:00 am visit the floating islands of the Uros. 12:30 pm. lunch in Uros Titicaca lodge. 19:00 pm Dinner and overnight. 07:00 am Breakfast and pick up the fishing nets that we put the previous day. 09:00 am Departure by boat to the island of Taquile. 11:40 am Arrival and beginning of the Visit to Taquile Island. 12:50 pm lunch on Taquile Island. 14:30 pm return to Puno city. 15:30 pm Arrival and transfer to the hotel in Puno. Transfer from train station Puno - Uros Titicaca Lodge - Puno. Visit the Uros floating islands. Lunch in Uros Titicaca Lodge. Transfer and shipment to Taquile Island. Transfer Port - hotel Puno. Tips to guides & reed boat skippers optional. For tours we use the best tourist transport of our environment it terrestrial or lake. The language of the local interpreter will be, Spanish/English. To Say Goodbye we request the respective service report. Anyway, please write to our contacts in the web outlines of the tours or excursions and other suggestions for logistics that may help you plan your stay at the lake. Any questions you may have (or if you'd just like to book! ), please do not hesitate to contact us here. This exclusive Lake Titicaca tour reaches places away the tourist circuit, please be a responsible traveler we try not affecting this special cultures. Please do not give the kids Candy, not sweets, there is no dental care in isolated areas and it is already a problem. Ask before photography, you might be asked for a "permission", in order to take the photo. Please bring back to the motor boat all your non-Biodegradable garbage: plastic and others. Enjoy your experiences. HAVE A NICE TRIP!!! For day trips, you generally need very little, but the following items are advisable to carry in a day pack and /or wearing them on. Bring a light backpack to carry things. T-shirt, optionally long sleeved shirt. Warm clothing a jacket or a fleece. Preferably bring cash because there are no ATM machines. Optional: If you wish, you can take some fruit, food, school supplies or anything that is beyond his families to share with them. THIS IS NO A HOTEL, IT IS A WAY OF LIFE Uros Titicaca lodge floating island was created for travelers looking for unique experiences and beauty of nature where you find inspiring activities, excursions with locals and gastronomy with identity and pleasant spaces designed to relax with privileged to admire the lake and nature views.